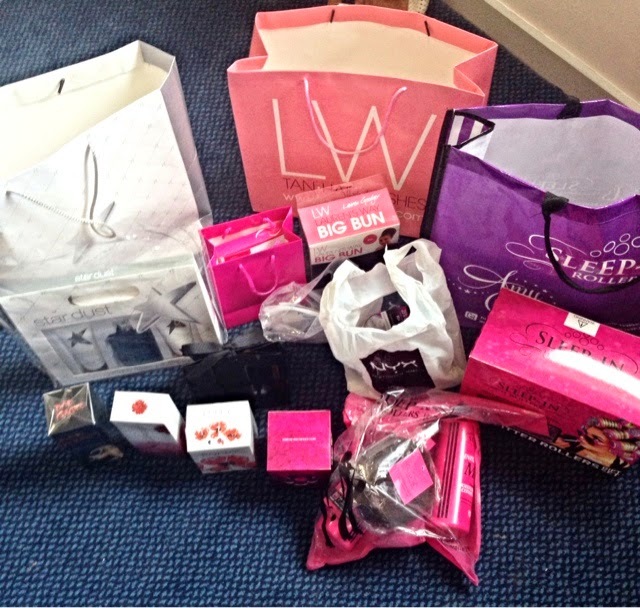 Yes that's right I did go pretty crazy with my shopping at the Beauty Show as you can see from the picture above! I also went to selfridges afterwards as my shopping hunger was still not full but I will do another post on that. I personally heard about the Beauty Show through this website I was visiting and they were advertising people to sign up and as soon as I saw I was available on the Monday and didn't have work, I immediately registered for my free tickets! After mentioning on Twitter, one lovely girl replied and she also said she was going. So we decided instead of being loners we would meet up at the train station! Paige also has a blog which you can check out here! I am so glad I have met her as we have so many things in common and it's nice to meet someone who also enjoys makeup, blogging etc so we have already planned our second trip together! One of the first things I brought is by this company called 'Fab Brows'. They sell eye brow powders with three different stencils for £20. It is also semi permanent and lasts up to 24 hours as well as waterproof. I had a demo and I really liked it! At the moment I use Anastasia DipBrow Pomade in Chocolate and I really love it so I think I will carry on using that whenever I want that sharp edgy look. However the Fab Brows are perfect for the natural look! As you can see the picture below is Paige's brows and they look really natural with that rounded edge. Next we got a free goodie bag full of perfumes! Well we paid £20 however we got the £20 back as a gift voucher which I am likely to use as I visited their website and they had some great perfumes online! So technically it wasn't free but it was? I have heard great things about Amy Childs sleep in rollers and as they were selling them for £10 of course I was like this is a bargain and I had to purchase! I also brought the shampoo and conditioner set with a medium hair bun for another £10! Great deal! Now NYX Cosmetics! This was the main reason I went there! I brought a few lip butters and their super skinny eye liner and also the popular white jumbo eye pencil! I love matte lip sticks, lacquers etc so when I saw they had matte lip butters I had to buy some! I really wanted nudes and light pinks as I have so many bold red, pink, orange colours already in my collection. Teeth whitening is something I always wanted to try but for some reason never got a round to it! I wear Invisalign braces and my package comes with teeth whitening when I finish my course which I will in a few weeks time wooo! So I wanted something where I could keep up with the dentist results! They were selling this for £30 however because Paige also brought one we were allowed to have it for £25 each! Finally, I brought some hair removable product. It is called Elegant Depilation. I paid £20 for a set of two and the lady said it should last me for around 2 years. I don't like shaving, I tend to usually go for a wax or use hair removable creams for my arms. I thought I would give this a try as it is a better alternative! I will post a review to let you guys know if it works. That is it people! My Beauty show haul is over! All the prices mentioned above in this post are not retail price. They were discounted because it was being sold at the show so the price I brought it for may not be the price which you pay online. Disclaimer - Everything was brought with my own money. Literally I want everything haha, looks like you got so many awesome goodies. I know the feeling! I wanted even more but could not carry all this as it was! Yay for Nyx! Great post, you really did go a little crazy but the discount prices were well worth it! Keep an eye out on nec website they have a few shoes coming up related to makeup & beauty! Haha I did! Didn't wna leave from there! This looks like such an amazing event, glad you had a good time! So jealous of all the goodies you bought, haha. You got loads of brilliant goodies, I'd love to go to the event.